If you click here, you will be taken to a YouTube video I received the other day from a choir colleague. I imagine his intent was to convert me, and I would become angry about the high taxes we are all forced to pay. Maybe I would join a riot against the government which would open news casts across Canada. However, this is already happening in Greece, Montreal and elsewhere. According to inventor and activist Ben Franklin, “nothing can be said to be certain except death and taxes.” But I wonder, rather than playing the role of the helpless victim, if we ‘gave’ our taxes as we give gifts, paying our taxes might not feel so deadly. After watching this video, a blog post entitled WWJD? arrived in my mailbox. The blog can be found at http://theducklows.ca/wwjd/. Reading this post changed my perspective. Jesus created a whip and overturned tables in Matthew 21. But if he wasn’t going to lead a riot, He would do something creative and miraculous like catch a fish with a coin in its mouth to pay the tax (Matt. 17:27). In this video, this young Canadian uses Matthew 21 as an example of how Jesus was angry about over taxation, greed and gluttony by a select few. If we have the same willingness to give as we do to receive, and view payments as a chance to give rather than pay a debt which we may or may not agree with. In other words, if we are generous, we will not worry about people taking money from us, let alone our government who has made Canada the envy of the world. Then our anxiety levels might just lessen and our perspective of politics and the wellbeing of our country, not just our small circle of friends, might just increase. Instead of viewing taxes as someone taking money from us, Jesus asks us to surprise them with our generosity. If we did, it might just make the nightly news! How do you feel about being led? I imagine this has a lot to do with who the leader is. We would likely prefer to be the leader, the responsible one, the one who is in charge of our own destiny. Jesus once told us, “when you were younger you dressed yourself and went where you wanted; but when you are old you will stretch out your hands, and someone else will dress you and lead you where you do not want to go.” (John 21:18). If we are used to being in charge, no matter our age, the feeling of being led may be an uncomfortable one. But if we have lived a life of stress, this idea may look refreshing. I invite you to spend a few quiet moments with this painting by the Chinese artist He Qi. 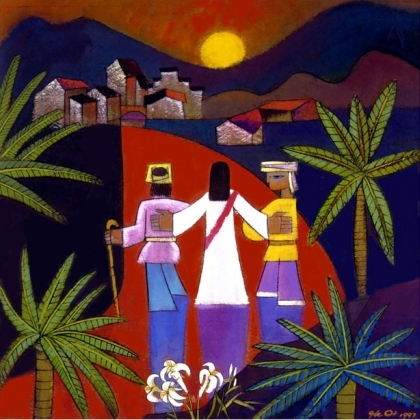 It is a depiction of Jesus walking with the two disciples on the road to Emmaus (Luke 24). What would it be like if Jesus was the One doing the leading? Would you be willing to walk at His pace? On May 27th (40 days after Easter) Christians will celebrate Pentecost, the day when Christ’s Spirit arrived on this earth and indwelt those who desire Him. Since then His Spirit has lead us in amazing ways. I am one of those people, and would be delighted to meet with you so we may learn “the unforced rhythms of grace.” Where might He lead you next?